Johnnie Walker’s Blenders’ Batch range has been extended again with the launch of three experimental Scotch whiskies. The world’s biggest-selling Scotch whisky is introducing Blenders’ Batch Wine Cask Blend, Blenders’ Batch Rum Cask Finish and Blenders’ Batch Espresso Roast as part of its ongoing exploration of flavour. The first to be released is Johnnie Walker Wine Cask Blend, a 40% abv whisky matured in unspecified wine casks. It will be released in global markets in September for around US$29.99. Johnnie Walker blender Aimée Gibson said the expression’s ‘lively fresh berry’ and ‘sweet toffee’ flavours made it an accessible whisky that’s perfect to mix in cocktails. 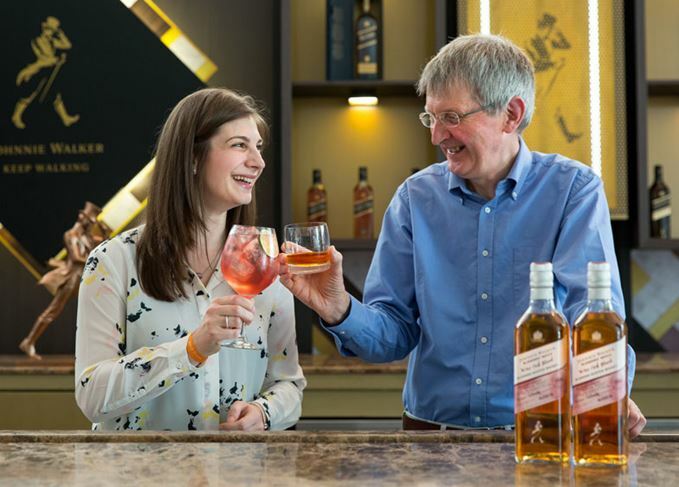 ‘My goal at Johnnie Walker is to make whiskies that can be enjoyed by people with a range of taste preferences, especially by those who might previously have thought that whisky isn’t for them,’ she said. Launching in bars this October will be Johnnie Walker Rum Cask Finish and Espresso Roast. The former features whiskies from Speyside and the Lowlands that have been finished in casks previously used for maturing Caribbean rum. Bottled at 40.8% abv, the blend – which was created by blender Chris Clark – is said to have fruity, spicy and sweet notes. Meanwhile, Johnnie Walker Espresso Roast has been made using heavily roasted barley, which imparts chocolate and coffee notes to the blend. Also blended by Gibson, the bottling has an abv of 43.2%. Johnnie Walker master blender Jim Beveridge said the Blenders’ Batch series is inspired by the blending team’s personal experiences. ‘Our blenders are given free rein to take inspiration from anything and everything around them when making whisky: experiences they’ve had, personal passions, sounds and flavours. All three expressions are being unveiled this week at brand owner Diageo's World Class cocktail competition in Mexico. They join the three expressions already in the Blenders’ Batch series – Red Rye Finish, Triple Grain American Oak and Bourbon Cask & Rye Finish. Part of the brand’s experimental range, the latest blend is made up of more than 200 whiskies. A stunning whisky line-up: 70yo Glenlivet, experimental Johnnie Walker, Compass Box and Wolfburn.